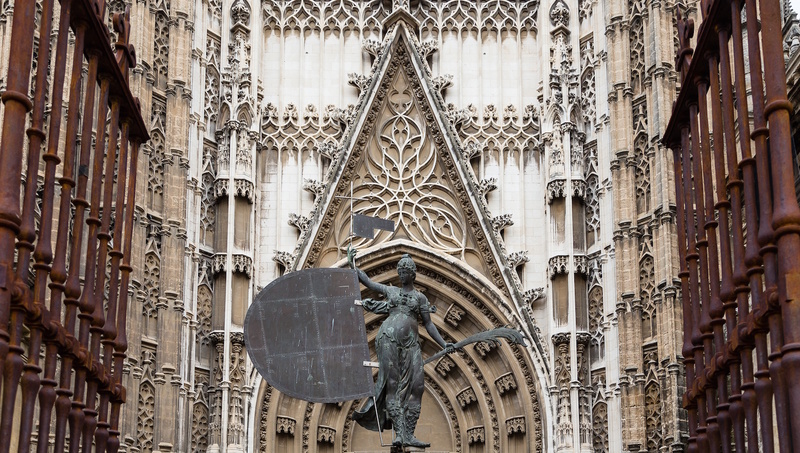 Seville's preeminent attraction, the Seville Cathedral, is the third-largest church in the world. A sublime specimen of Gothic architecture with a fascinating history, the cathedral is a formidable human achievement that will certainly take your breath away. 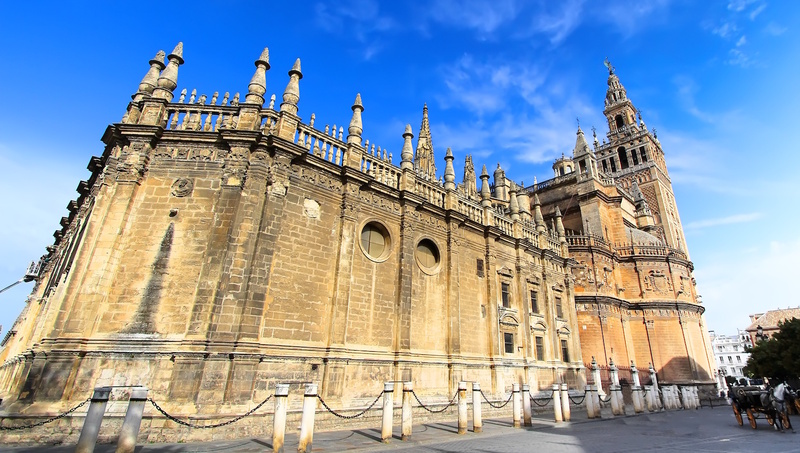 The cathedral's famous bell tower, called Giralda, was originally built as a minaret in the late 12th century. The stunning, 105-meter-tall tower is a UNESCO World Heritage Site. The Capilla Mayor, the cathedral's main chapel, has the longest nave of any cathedral in Spain. Its 42-meter-high ceiling is lavishly decorated in Gothic and Baroque styles. 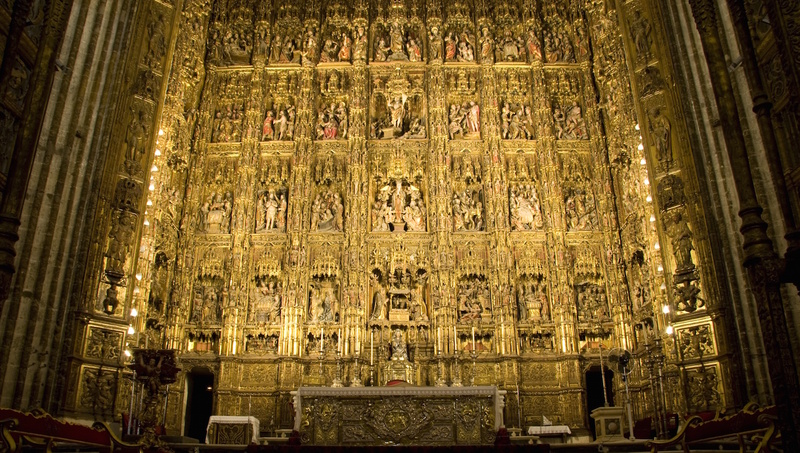 The Capilla Mayor's retablo, aka altarpiece, is the largest in Christendom. This sublime masterpiece was entirely carved out of wood, depicting 42 scenes from the life of Christ. In total, the cathedral has 15 doors, each featuring a distinct architectural style and decorated with beautiful, extremely ornate reliefs and carvings. 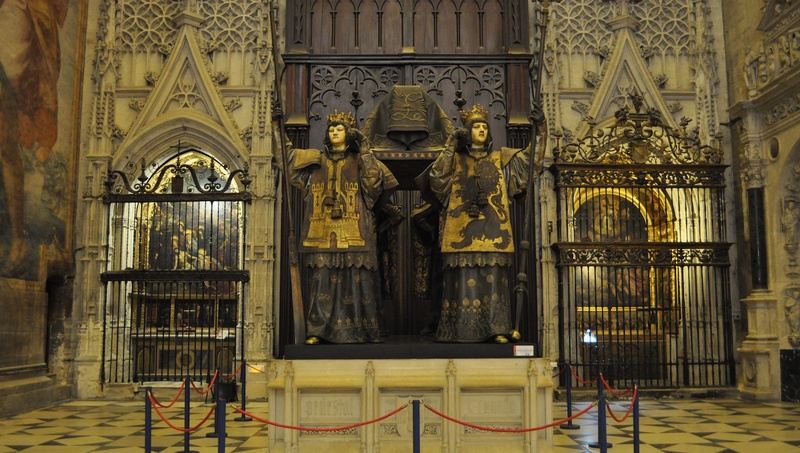 In this gorgeous monument, Columbus' casket is held aloft by four statues, each representing one of the four kingdoms that comprised Spain during the explorer's life. 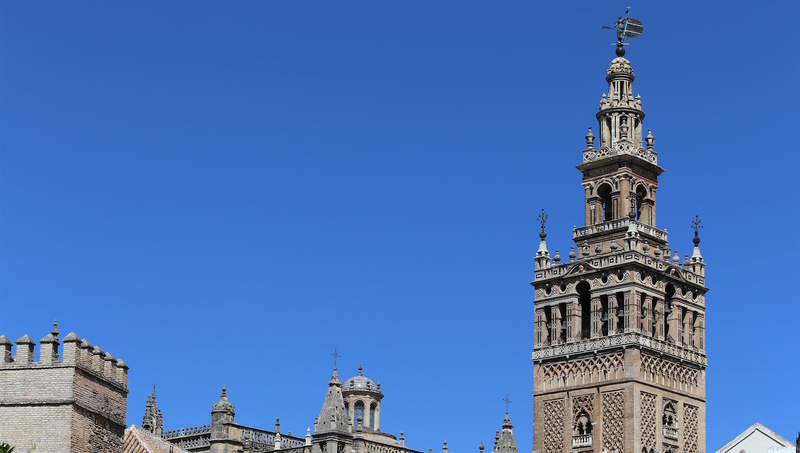 Although it's a long climb to the top of the Giralda, it's not an overly difficult one, and those who brave it are rewarded with one of the most spectacular views of the entire city – don't miss out! As children under the age of 16 accompanied by an adult don't have to pay the admission fee, remember to bring their IDs to be sure to enjoy the concession. The same is true for seniors and students who want to take advantage of discounted tickets. Open Monday 11:00AM to 3:30PM, Tuesday to Saturday 11:00AM to 5:00PM and Sunday 2:30PM to 6:00PM. Adult general admission tickets start at 9 € and continue up depending on transportation and tour options. You won't need a guide in the Cathedral, but several tours include a stop with further information provided. Take bus line C5 to García de Vinuesa or tram line T1 to Archivo de Indias. Queue lines can get quite long, so keep this in mind if you're visiting on a very hot day and plan accordingly.